Honey, the wild and rebellious sister, is off to Australia for a fresh start with her Dad and his girl friend. She used to a be a the bad girl, getting expelled from school and running away. Can she get put of her bad habits? When she arrives, her Dad takes a few days off to help Honey settle in, and they all play happy families. She has a lovely room, and her Dad buys Honey a laptop. Consequently Honey creates a new social networking page, to completely get a fresh start. She skypes everyone back home in England regularly. She goes to the beach and meets a boy called Riley, and meets Ash, who works in the café. She goes to her new all girls school, and makes two good friends called Tara and Bennie. They aren't who she would normally make friends with, but she builds a good bond with them. Honey gets close with Ash, and is getting on well in Australia. But what happens when her Dad is constantly working late? Someone is posting nasty statuses and images on Honey's social networking page, and she has no idea who it is. Is she going to loose all of new friends due to this? Someone else is lying, pretending to be someone they are not, but when will Honey realise? I rate this book 4.5/5 hoots, I would have liked to see more action from Honey's sisters at home, but I understand that each book focuses on one sister. 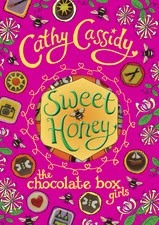 Overall, another good one from Cathy Cassidy!